If you're searching for useful scholarly writing on black poetry, you won't look too far before you'll find the work of Meta DuEwa Jones. Her book The Muse Is Music: Jazz Poetry from the Harlem Renaissance to Spoken Word (2012) extends and clarifies long-running conversations in the critical discourse about how integral music and voice are to the production of poetry over the course of the 20th century. And perhaps, she takes us beyond the 20th century. "Ultimately, the history and experience of the transatlantic slave trade," she writes early on, "haunts and hallows the legacy of voice and voicing in black expressive culture." Meta takes us from Langston Hughes all the way through poets who style their works based on hip hop. The Muse is Music corresponds to a large body of writings, including books by Tony Bolden, Aldon Nielsen, Evie Shockley, and James Smethurst, to name a few. Her book, like those, also brings to mind Eugene B. Redmond's foundational work Drumvoices: The Mission of Afro-American Poetry (1976). 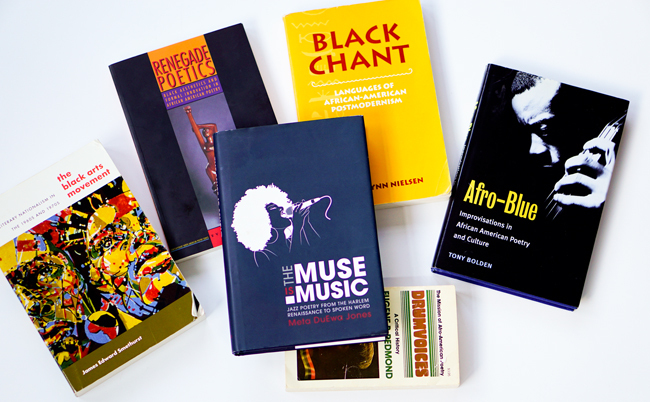 Meta, along with a range of different scholars, contributes to a distinct body of Black Arts-related scholarship produced over the last decade. Black arts scholarship, of course, forms the basis of my own work and really my entry into critical writing on black poetry. As I've noted before, many of the scholars have been generous with their time and ideas with me over the years. Evie Shockley and Meta, for instance, provided me with all kinds of guidance at conferences and in their writings. I communicate regularly with scholars William J. Harris and Tony Bolden on Facebook, and Jerry W. Ward, Jr. through email. At the moment, I'm preparing for my fall courses, and was looking back on notes from Meta's The Music is Music. I was quickly reminded how linked her work is to these many mixes of conversations and scholarly writing on black poetry.